Acorn Stairlifts are one of the most respected and renowned stairlifts manufacturers, with a worldwide reputation for reliability, innovation safety and design simplicity. Founded in 1992 in Yorkshire, England, they have grown to become the largest manufacturer and supplier of stairlifts worldwide. BM Stairlifts are an approved Acorn Stairlifts reseller and maintenance provider and have been installing and servicing Acorn Stairlifts since the company’s foundation in 2005. One of the most popular Acorn lifts is the Acorn Superglide Stairlift. Acorn Stairlifts produced a unique design and implementation process that allowed for speedy stairlift installations. It allowed for a quick and easy stairlift assemble based on a modular rail system which follow the profile of the staircase. The system is broken into a range of rail sections. Divided the system into sections allows for a quickly assembly time and this flexibility can be added to almost any staircase. This FastTrack system has allowed Acorn Stairlifts to grow exponentially since the company was founded in 1992, in fact it is said that an Acorn Stairlift is installed every nine minutes around the world. Customer proof that the Acorn is trusted, reliable and adaptable for any type of staircase design and layout. They have expanded rapidly and now have offices in the US, Germany, Canada, South Africa, Italy and Australia. Arthritis Foundation also recognised Acorn Stairlifts success and innovation by awarding them with the ‘Ease of Use Commendation’. For a straight staircase, the Acorn Superglide stairlift is the ideal solution, stylishly designed and built to provide maximum comfort. It comes with a slimline fold-away design and a wealth of features. All come with a remote control as standard and a manual or powered folding hinged track is also available. There are usually a number of factor that contributes to a successful company. It could be as simple as market timing, excellent board level leadership, product innovation, the product itself, the maturity of the company and others. This blog post will look at some of the logical reasons why Acorn Stairlifts became should a ‘stairlift’ force in Ireland. Acorn Stairlifts offer as standard 12 month guarantee. That can only lead to a positive level of customer assurance and confidence. A bit like free servicing for your car, 12 months after purchase. Who could say no to that!!? Speaking of 12 months stairlift guarantee, Acorn Stairlifts in Ireland also have a five year warranty, which may come at an extra cost, so check out the fine print! They are also only a phone call away, seven days a week which also adds an extra layer of credibility and assurance. The fact that Acorn Stairlifts have been in operational and established in Ireland for such a long period of time, sends out a signal to all that they must be doing something right!! Growth speaks for itself! Almost all consumer based products must go through a vigorous testing regime and is exposed to a battery of quality and safety related tests. Acorn Stairlifts are tested and accredited to a very high standard and according to their marketing material, they in fact, exceed the safety standards set out by the regulatory body. Yet again another facet of Acorn Stairlift Ireland which has allowed the company to grow exponentially over that past number of decades. To summarise, timing, great leadership and social factors can be the difference between success and failure, however Acorn Stairlifts Ireland have the necessary fundamentals in place that can lead to growth and success. 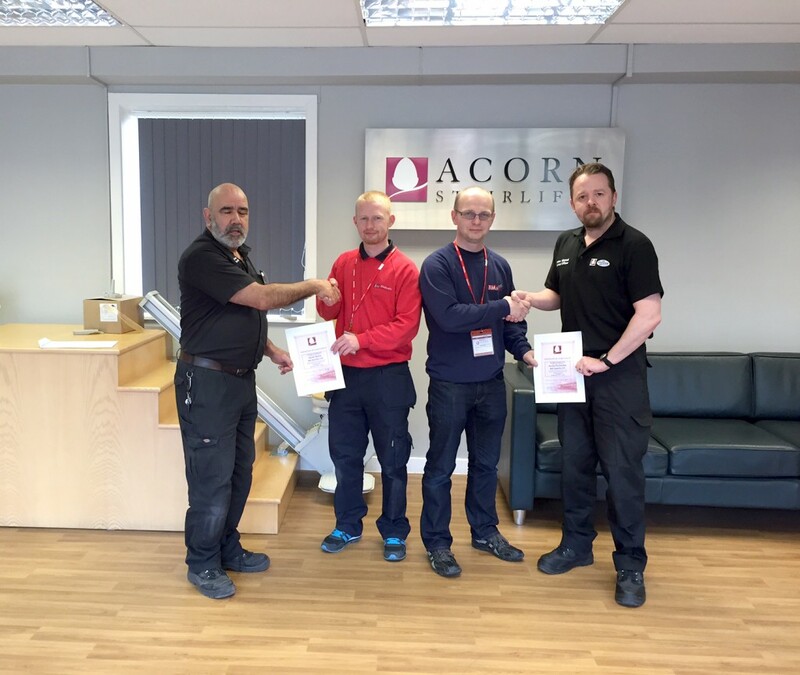 Acorn ensure they provide a great stairlift, great aftercare and continued development and investment towards reliability and product standards. Here at BM Stairlifts we are registered Acorn Stairlifts installers in Ireland. If you have any enquiries about an Acorn Stairlift and live in Ireland, contact Jen or Jacinta at 1890-837274 or email info@bmstairlifts.ie. BM Stairlifts are an authorised reseller and installer of Acorn Stairlifts, we have a team of fully trained and accredited engineers. See our Contact Us page or the Acorn Stairlifts Free Quotation page and our team will arrange a visit and a free installation quotation that will meet your budget and your requirements.